The NPR News item What's The Issue With Nitrate Film Stock? 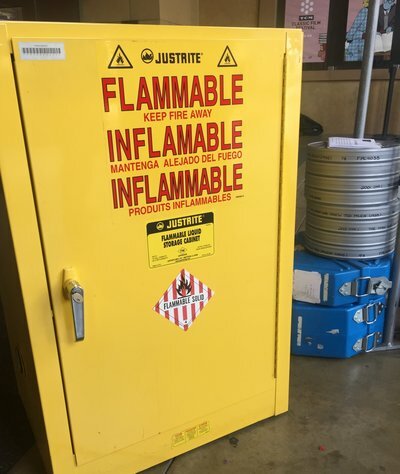 It's Combustible describes substantial effort made at the 2017 TCM Film Festival to upgrade a projection booth in order to more safely project nitrate prints of some selected films. TCM wanted to screen some of the nitrate prints that exist in archives at its festival, so it worked with Martin Scorsese's The Film Foundation. Together with the Hollywood Foreign Press Association, Academy Film Archive and the American Cinematheque, they brought the projection booth of The Egyptian Theater up to fire code, and Bartok says they also modified two vintage 35mm projectors. Nitrate film stock has been praised for the beauty of its images and for truly allowing cinematographers to paint with light — whites pop off the screen, blacks are deep and rich, and grey tones shimmer. Color nitrate has been described as equally breathtaking. Dennis Bartok manages the Egyptian Theatre, where the films are playing. He says his single most unforgettable screening experience was watching a Technicolor nitrate print of the movie Black Narcissus. "So, people will compare them to an illuminated manuscript or something like that. All I can say is watching Black Narcissus really is a spiritual experience for people who love cinema." Did or does nitrate film stock have some physical or chemical properties that leads to superior (shimmering) black-and-white and (breathtaking Techni)color? Was this ever measured and quantified in some way? below: From the NPR article; Nitrate film stock is extremely flammable — it was replaced by more stable stock in the 1950s. credit: Beth Accomando. Cellulose nitrate film material was the first successful transparent, flexible stock. It made roll film and motion picture (cine) film possible. The bad news was cellulose nitrate self-combusted at about 300°F. The movie houses of that era used carbon arc as the projection light source. If the film were to break during a movie, the stopped film would likely catch fire. I think a movie theater burned down every day, somewhere in the world. This changed in the 1950’s when the formula changed to cellulose acetate. This new film base will burn, but it self- extinguishes. This material is labeled “safety film”. In my opinion, the same film emulsion coated on either will be visually the same. The likely reason someone would admire black & white movies of the earlier era is the fact that early photo film was sensitive only to violet and blue. As film making progressed, films gained sensitivity to green (orthochromatic) and then to red (panchromatic). This progression improved the monochromatic rendering, Blue only and the blue-green sensitive films presented an image with lots of contrast. The latter panchromatic materials were more subdued. Some might say the older materials were better, but others like me would disagree. As to the first successful motion picture color film process, Technicolor, the camera exposed three black & white films simultaneously. Each was uniquely exposed to one of the three light primary colors via strong red, green, and blue filters. The three black and white films were each printed on a special film emulsion called a matrix. The matrix displayed a positive image (black & white transparency). The matrix film was developed in a “tanning” developer and the result was a relief image. By relief, I mean the image had depth. The depth of the image (thickness) of the emulsion varied in proportion to the amount of silver in any given location. The three matrix films were soaked in dye. Cyan dye for the film that recorded the red image, yellow dye for the film that recorded the blue image, magenta dye for the film that recorded the green image. The dyes soaked into the film in proportion to the swelling of the emulsion. A release print film was made for projection at the theater. The release film was a gelatin coat on the cellulose nitrate base. The three matrix films were pressed against the release film. Under pressure, the dye in the matrix film was squeezed out and transferred to the release film. This dye transfer was made three times. Because the release print film was a non-photo chemical material, the choice of dyes that could be used was vast. Today’s color films are super restricted as to what dyes can be used. This hinders their final appearance. Some will say the Technicolor process was the grandest of all the color cine film methods. Some will say its yield was too contrasty and too vivid. I say, “a tip of the hat to those who devised this marvelously wonderful photographic tool”. By the way, it had a still picture counterpart called Dye Transfer. Most would say, the colors of the Dye Transfer process top anything you have ever seen on photographic paper. Not the answer you're looking for? Browse other questions tagged film safety projection or ask your own question. Is 125 or 400 ISO film better for black and white studio shots? How did my Portra 400 color negs came back black and white? Where to get film developed and high quality scans? Do I use black and white film or color film? Can the same color film have a slightly different tint depending on which photo lab I send the film to? What colour scheme for model aircraft should I use to give a realistic black and white film photo?